A master walks on stage with his students. All are wearing traditional martial arts outfits. The audience sits silently in anticipation. The atmosphere is solemn. Student and teacher bow respectfully to each other. The student takes out a rubber knife and prepares to stab the teacher. The teacher prepares for the mock attack. The student rushes in, with controlled movements, the master teacher with years of training and many hours of practice with this student, skillfully steps aside and grabs the wrist of the attacker, with a flick of the wrist the master throws the attacker in a cartwheel to the ground. The audience erupts in applause. Teacher and student bow to the audience. The performance was perfectly executed. As the crowd leaves the auditorium students hand out flyers. Many members of the audience vow to sign up for trial lessons. The evening was a great success. A member of the audience looks at his flyer, "Fear no man, walk the streets with confidence, train in....(fill in the blanks with your favorite martial art)". Someplace else in town a young man walks out of a concert hall, having just enjoyed a great show he is feeling wonderful. As he walks out into the parking lot three young men surround him, they want his jacket and his wallet. He says No Way. They approach him. He does not know what to expect. Suddenly one of the young men lounges at him with a knife, it enters his abdomen. They take his jacket and wallet and flee the scene. An ambulance arrives soon and takes the teen to the hospital where he is pronounced dead. My friends this is Fantasy vs. Reality and you must understand the difference. I too spent many years doing these fancy martial arts techniques. I was tested and earned black belts. But then I saw the light. All this moving around in comfortable karate gi's, grabbing the wrist of the attacker and flipping him over, oh my, it will not happen. This will get you killed. There are gang members out there who have no regard for human life. In Los Angeles alone there are more than 1,000 gangs. These men/boys will kill you in a heartbeat. They will catch you unprepared. They will not bow to you and give you time to prepare. They will stab stab stab!!! and leave you for dead. That is why we have changed our system, that is why we gave up and discontinued all those grabbing techniques and side stepping. Even if you did succeed in somehow grabbing the wrist of the attacker he will twist his arm and get out of the grab with ease. Don't you understand that??!? I am trying to bring home the reality of this situation. All those fancy skills and Akido twists and turns are lovely and beautiful but do you really want to rely upon that in the darkness of a Dark Alley? All it takes is making a wrong turn and you are in Gangland. All it takes is being mistaken for someone else. A young man, an honor high school student, is having lunch in LA. A young woman walks in and asks....Where you from? (i.e. to which gang to you belong?). He does not understand, he is not a gang member. His answer appears as disrespectful. Gang members come in and beat him, and then as he is hurting they come back with a gun and shoot him. He is paralyzed for life, but he lives less than a year. This is reality. I read about gang activity in Los Angeles and I suddenly realize; I have been on those streets, I have been in areas where gang attacks have taken place, only by the grace of God or pure luck I was not attacked. But how long can we rely upon luck or grace? Is our life a game of Russian Roulette? Rethink your Krav Maga training. Keep it SIMPLE. Stay Alive. 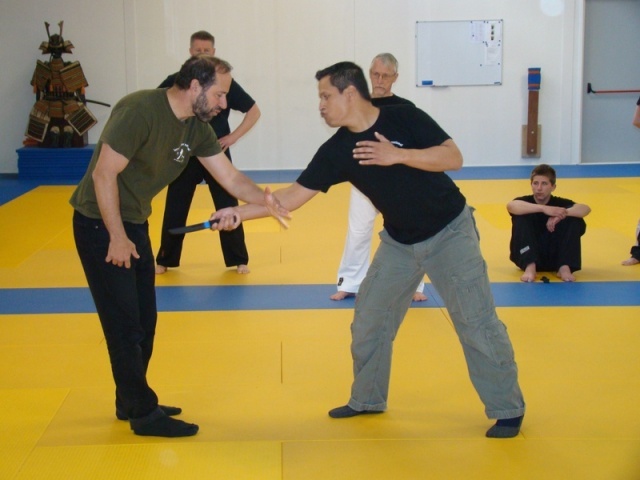 This is a simple and effective knife defense, there is no grabbing or twisting.